Elharar was dismayed by the decision taken on Sunday by the Justice Ministry’s Police Investigation Unit, which is an external body that looks into police misconduct, not to take action against two police officers who used a stun gun to subdue Ethiopian-Israeli Yosef Salamsa in April 2014. Salamsa was apparently left traumatized by the incident and committed suicide later that year. ”Police violence against Israelis of Ethiopian descent has become a major problem, and it cannot be treated with a Band-Aid,”State Control Committee Chairwoman Elharar said, as cited by the Knesset’s official website. The Police Investigation Unit said it had found no evidence of any criminal conduct by police officers and subsequently decided to close the case. Elharar was outraged by the move, calling it a “shocking” decision. “Those whose skin color is different have been treated differently by the Justice Ministry’s Police Investigative Division,” she added. Salamsa was arrested after police received reports of a man armed with a knife in a park who was trying to break into a building. Salamsa was believed by the police to be a suspect and they used a stun gun to apprehend him, before arresting him. Following the incident, his family said Salamsa needed psychological treatment. Three months later, he committed suicide after jumping off a cliff. Lawyer Dror Matityahu, representing the Salamsa family, said that the officers had “violated the protocol for using Tasers, filed false reports, left Salamsa on the floor, handcuffed and beaten, and threatened his family members. “Any citizen who would have acted in this manner would have been put on trial, but there is a different law for officers,” he added, according to a press release from the committee meeting, as published on the Knesset’s website. Although the Police Investigation Unit admitted the officers did not follow procedure, the ministry said it had found no evidence of any criminal wrongdoing, despite failing to warn Salamsa that a Taser was about to be used. 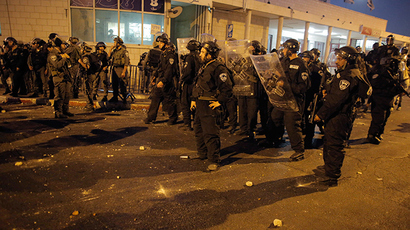 ”Police officers have rights too, and as long as we have not received any incriminating material – and until now we haven’t – we cannot act against them… Some of the officers have conduct problems, and we have a lot to do in this regard,” said Major General Gila Gaziel, head of the police’s Human Resources Department. Meanwhile, Ziva Mekonen-Degu from the Israeli Association for Ethiopian Jews told the committee that at least one member of every family in the community had been either arrested, detained or has had a criminal investigation opened against him or her. “Thirteen young Ethiopian-Israelis have committed suicide since the community launched its campaign against police brutality,” she said. Over the summer of 2015, Israel was rocked by a series of protests held by Israeli-Ethiopians who were demonstrating after video footage emerged of two police officers shoving and pushing a black soldier. The incident was not related to the arrest of Salamsa. This prompted Israel’s President Reuven Rivlin to say in May that the government “made a mistake” ignoring the issues of the local Ethiopian population. “It is a wound of a community crying out over its feeling of discrimination and racism that are falling on deaf ears. We must face this open wound straight on,” Rivlin said. The two officers were suspended, but in June, 2015, Attorney-General Yehuda Weinstein decided to end the investigation into the case after both the state prosecutor and the Police Internal Investigations Department recommended that charges against the policeman be dropped. There are approximately 135,500 Ethiopian Jews who live in Israel, and more than a third of them (more than 50,000) were born there. “Israel has prided itself on taking Jews all over the diaspora and making a new Israeli out of them. But it turns out they are second class citizens,” Amir Oren a senior columnist for Haaretz told RT in May, 2015. “Some of them are Arabs, some of them are immigrants from other countries, and some of them, because of their different skin color are Ethiopians. It is regrettable and Israeli society has a lot of work to do in order to rectify it,” he added. Some have described the drought as the worst in 50 years, so severe that 10 percent of the population cannot feed itself, and humanitarian groups are asking the international community to declare a “code red” situation for children. The Thomson Reuters Foundation notes that Tanzania has long served as a human-smuggling route from Ethiopia and Somalia to (literally) greener pastures in South Africa and Europe. A growing number of migrants are stalling out in Tanzania, often after smugglers abandon them, absconding with the $1,000 to $2,000 fee paid for transit. Smuggler safe houses in Tanzania have been found packed with abandoned migrants. “There are too many foreigners who live in our country illegally, we will not hesitate to arrest and deport them,” Tanzania’s Home Affairs Minister, Charles Kitwanga, told the Thomson Reuters Foundation on Monday. Chief Peter Kakamba told the BBC patrols would be increased to find migrants, and arrest Tanzanians who have been assisting them. There have been complaints of corrupt officials taking advantage of the migrant crisis by taking bribes, and stealing the property of deported migrants. 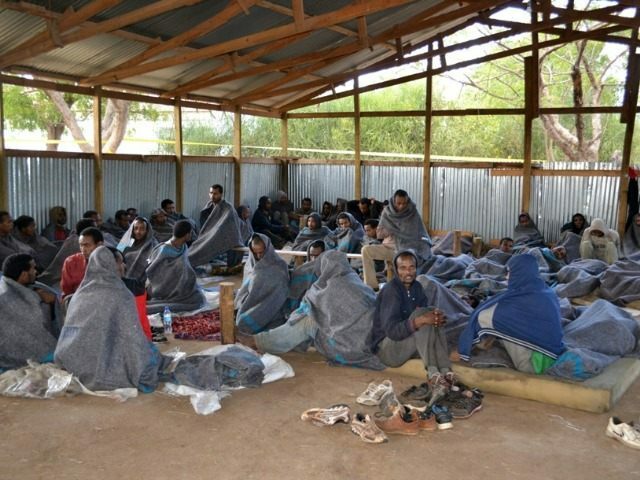 The Ethiopian government has also been cracking down on human smugglers. “Smugglers are luring the young and old and then dumping them in the deserts or even killing them if they can’t afford the money required to complete the journey,” the mayor of one Ethiopian town told the BBC in October. Execution has been considered as a penalty for human smugglers. 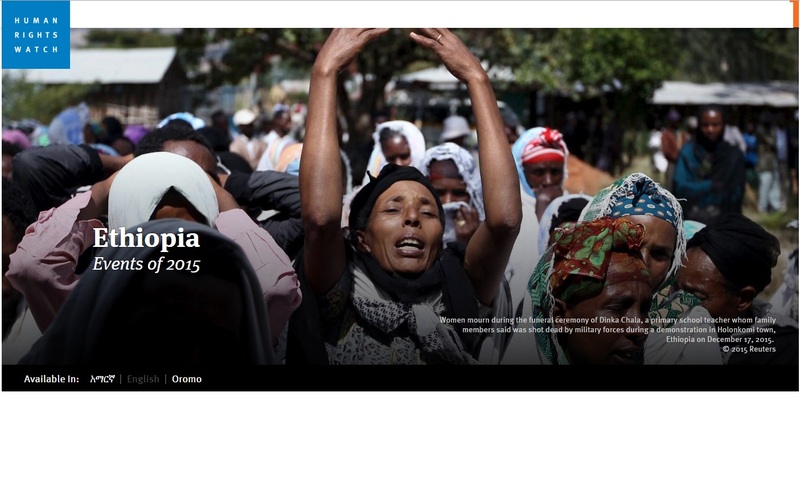 In Ethiopia in 2015 there were continuing government crackdowns on opposition political party members, journalists, and peaceful protesters, many of whom experienced harassment, arbitrary arrest, and politically motivated prosecutions. The Ethiopian People’s Revolutionary Democratic Front (EPRDF), the ruling party coalition, won all 547 parliamentary seats in the May elections, due in part to the lack of space for critical or dissenting voices. Despite a few high-profile prisoner releases ahead of the June visit of United States President Barack Obama, there was no progress on fundamental reforms of the deeply repressive laws and policies constricting Ethiopian civil society organizations and media. May’s federal elections took place in a general atmosphere of intimidation, and concerns over the National Electoral Board’s lack of independence. Opposition parties reported that state security forces and ruling party cadres harassed and detained their members, while onerous registration requirements effectively put opposition candidates at a disadvantage. Opposition parties reported that government officials regularly blocked their attempts to hold protests and rallies in the run-up to the election by denying permits, arresting organizers, and confiscating equipment. These restrictions, alongside the absence of independent media and civil society, meant there was little opportunity for dissenting voices to be heard or meaningful political debate on key issues ahead of the elections. Eighteen individuals identified as leaders of the Muslim protest movement that swept across Ethiopia from 2012-2014 were convicted in July under the Anti-Terrorism Proclamation and sentenced in August to between 7 and 22 years each after closed, flawed trials. Authorities detained them in July 2012 when some Muslim communities were protesting against perceived government interference in their religious affairs. An unknown number of ethnic Oromo students continued to be detained, many without charge, after protests throughout Oromia in April and May 2014 against the planned expansion of Addis Ababa’s municipal boundary into Oromia. Security personnel used excessive and at times lethal force, including live ammunition, against protesters in several cities, killing at least several dozen protesters, and arrested hundreds. 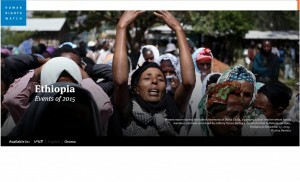 There have been no investigations by Ethiopian authorities into the deaths and the use of unlawful force. Those released said they were tortured or otherwise ill-treated in detention. Ethnic Oromos make up approximately 45 percent of Ethiopia’s population and are often arbitrarily arrested and accused of belonging to the banned Oromo Liberation Front (OLF). Media remained under government stranglehold, with many journalists having to choose between self-censorship, harassment and arrest, or exile. At least 60 journalists have fled into exile since 2010. Tactics used to restrict independent media included targeting publishers, printing presses, and distributors. In June, journalist Reeyot Alemu and five other journalists and bloggers from the Zone 9 blogging collective were released from prison ahead of President Obama’s visit to Ethiopia, On October 16, the remaining four imprisoned Zone 9 bloggers were acquitted of terrorism charges after 39 hearings and 539 days in detention. A fifth charged in absentia was also acquitted. Many other journalists, protesters, and other political opponents continued to be prosecuted under the Anti-Terrorism Proclamation, and many journalists including Eskinder Nega and Woubshet Taye remain in prison.The 2009 Charities and Societies Proclamation (CSO law) continues to severely curtail the ability of independent nongovernmental organizations to work on human rights. The law bars work on human rights, good governance, conflict resolution, and advocacy on the rights of women, children, and people with disabilities if organizations receive more than 10 percent of their funds from foreign sources.The government regularly monitors and records telephone calls of family members and friends of suspected opposition members and intercepts digital communications with highly intrusive spyware. Leaked emails from Milan-based Hacking Team, which sold spyware to the Ethiopian government, reveal that despite warnings of the risk of Ethiopia misusing their spyware, they issued a temporary license to Ethiopia while they began negotiations in April on a new contract worth at least US$700,000. Ethiopian security personnel frequently tortured and otherwise ill-treated political detainees held in both official and secret detention centers to give confessions or provide information. At its UN Universal Periodic Review in 2014, Ethiopia accepted a recommendation to “adopt measures which guarantee the non-occurrence of cases of torture and ill-treatment in places of detention,” but there is little indication that security personnel are being investigated or punished for carrying out these abuses. The Liyu police, a Somali Regional State paramilitary police force without a clear legal mandate, continued to commit serious human rights abuses in their ongoing conflict with the Ogaden National Liberation Front (ONLF) in Ethiopia’s Somali Region, with reports of extrajudicial killings, arbitrary detention, and violence against civilians who are accused of supporting or being sympathetic to the ONLF. Andargachew Tsige, a United Kingdom citizen and secretary-general of the Ginbot 7 organization, a group banned for advocating armed overthrow of the government, remains in detention in Ethiopia after his unlawful 2014 deportation to Ethiopia from Yemen while in transit. He had twice been sentenced to death in absentia for his involvement with Ginbot 7. UK consular officials visited Andargachew only three times, amid growing concerns about his mistreatment in detention. In April, the UN Working Group on Arbitrary Detention called on Ethiopia to release and compensate Andargachew. Some donors, including UK’s Department for International Development (DFID) and the World Bank, rechanneled funding from the problematic Protection of Basic Services (PBS) program in 2015. PBS was associated with the abusive “villagization program,” a government effort to relocate 1.5 million rural people into permanent villages, ostensibly to improve their access to basic services. Some of the relocations in the first year of the program in Gambella region in 2011 were accompanied by violence, including beatings and arbitrary arrests, and insufficient consultation and compensation. Some Gambella residents filed a complaint in 2013 to the World Bank’s Inspection Panel, the institution’s independent accountability mechanism, alleging that the bank violated its own policies on indigenous people and involuntary resettlement. The Inspection Panel identified major shortcomings in the PBS program in its November 2014 recommendations, although the World Bank Board largely rejected the findings in February. A translator who worked with the Inspection Panel in Gambella was arrested in March and charged under the Anti-Terrorism Proclamation in September 2015. There are ongoing reports of forced displacement from development projects in different regions, often with minimal or no compensation and little in the way of prior consultation with affected, often indigenous, communities. Allegations have arisen from commercial and industrial projects associated with Addis Ababa’s expansion and the continued development of sugar plantations in the Lower Omo Valley, which involves clearing 245,000 hectares of land that is home to 200,000 indigenous people. Communities in Omo have seen their grazing land cleared and have lost access to the Omo River, which they relied on for crops. Individuals who questioned the development plans were arrested and harassed. Violent incidents, both between different ethnic groups and between the government and ethnic groups, increased in 2015 partly due to the growing competition for grazing land and other resources. The reservoir behind the Gibe III dam began filling in January 2015, reducing the annual natural flood that replenished the agricultural lands along the banks of the Omo River. Ethiopia enjoys strong support from foreign donors and most of its regional neighbors, based on its role as host of the African Union and strategic regional player, its contribution to UN peacekeeping, security and aid partnerships with Western countries, and its progress on development indicators. The African Union(AU)—the only international body that monitored the May elections—declared the elections “credible” despite the severe restrictions on opposition political parties, independent media, and civil society. Ethiopia continued to facilitate negotiations between warring parties in South Sudan, and its troops maintained calm in the disputed Abyei Region. Ethiopia deploys troops inside Somalia as part of the AU mission, and in 2015 there were growing reports that abusive “Liyu police” forces were also deployed alongside the Ethiopian Defense Forces. Ethiopia continued to host hundreds of thousands of refugees from South Sudan, Somalia, and Eritrea. Ethiopia is one of the largest recipients of donor aid in Africa, receiving almost $3 billion in 2015 despite allegations of human rights abuses associated with some development programs, including forced displacement in Gambella and the Omo Valley. There are no indications that donors have strengthened the monitoring and accountability provisions needed to ensure that their development aid does not contribute to or exacerbate human rights problems in Ethiopia. At the same time they accuse the federal government ofriding roughshod over local sensitivities with a plan to extend administration of overcrowded Addis Ababa into Oromia, which surrounds the capital.